On this international spy drama, Annie (Piper Perabo) and Auggie (Christopher Gorham) work together to fulfill their missions. The mission of Covert Affairs of course is to attract big enough ratings for USA to renew it for another season. The TV show’s cast also includes Anne Dudek, Eion Bailey, Kari Matchett, Peter Gallagher, and Sendhil Ramamurthy. Here are the most recent ratings for Covert Affairs on USA. The TV show’s ratings are the best way to tell if it will be cancelled or renewed for a fourth season. The third season airs on Tuesday nights and there are 16 episodes. Final season averages: 0.8 rating in the 18-49 demographic with 3.06 million total viewers. 0.7 demo rating (+0% change) with 2.47 million (+1% change). Season averages: 0.81 in the demo with 3.06 million. 0.7 demo rating (+40% change) with 2.45 million (+8% change). Season averages: 0.81 in the demo with 3.10 million. 0.5 demo rating (-29% change) with 2.28 million (-3% change). Season averages: 0.82 in the demo with 3.14 million. 0.7 demo rating (-13% change) with 2.36 million (-14% change). Season averages: 0.85 in the demo with 3.21 million. 0.8 demo rating (0% change) with 2.75 million (0% change). Season averages: 0.86 in the demo with 3.28 million. 0.8 demo rating (-11% change) with 2.76 million (-21% change). Season averages: 0.86 in the demo with 3.33 million. UPDATE: Covert Affairs has been renewed with a 16 episode fourth season. 0.9 demo rating (-10% change) with 3.47 million (-12% change). Season averages: 0.87 in the demo with 3.39 million. 1.0 demo rating (+25% change) with 3.94 million (+15% change). Season averages: 0.87 in the demo with 3.38 million. 0.8 demo rating (+14% change) with 3.44 million (+6% change). Season averages: 0.85 in the demo with 3.31 million. 0.7 demo rating (-22% change) with 3.23 million (-8% change). Season averages: 0.86 in the demo with 3.29 million. 0.9 demo rating (0% change) with 3.51 million (+8% change). Season averages: 0.88 in the demo with 3.30 million. 0.9 demo rating (+29% change) with 3.25 million (+26% change). Season averages: 0.88 in the demo with 3.26 million. 0.7 demo rating (-30% change) with 2.58 million (-31% change). 1.0 demo rating (+11% change) with 3.74 million (+16% change). Season averages: 0.93 in the demo with 3.49 million. 0.9 demo rating (0% change) with 3.22 million (-8% change). Season averages: 0.90 in the demo with 3.24 million. 0.9 rating in the 18-49 demographic with 3.26 million total viewers. Season average: 0.90 in the demo with 3.26 million. Reference point: The second season of Covert Affairs averaged a 1.1 rating in the 18-49 demographic with 3.76 million total viewers. What do you think? Do you still like the Covert Affairs TV series? Are you hoping that it’s renewed for a fourth season? Covert Affairs: Cancel or Renew for Season Six? I love this show!!! I only watch three shows and this is one of them!!!! Please keep it!!!! I love watching and am a BIG FAN!!!! If that tells you anything. If I have to work that night then I record it to watch ASAP… Please keep it alive!!!! Very, very disappointed that this show may not comeback. I agree I hate reality shows…..this was a refreshing change. Please bring it back. I very much enjoy this show. Hope it continues. I agree totally with Mel,s comment that there is no consistency of it’s showing, in fact I am not sure if I have seen season 3. The last time I checked it was a rerun, although I loved each weekly show, I do not like reruns. More publicity needed for sure! I LOVE love LOVE this show. I buy the series on my iPad and have them download as they become available. I am an international flight attendant and this is how I watch my programs. I only do this with three series, if that tells u anything about how strongly I feel about this series………PLZ. PLZ. PLZ. do NOT take this show away!!!! 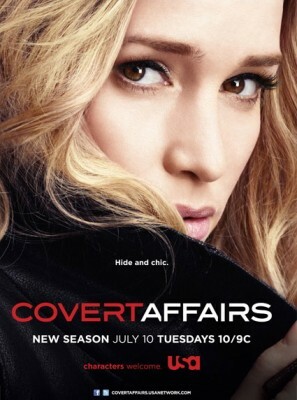 I look forward to watching ‘Covert Affairs’ on Tuesday nights. I ‘HATE’ all the ‘Reality Shows’ on the other networks, I could really care less about what ‘Kim Kardashian’ is doing and ‘The Bachelor/Bachelerette is nothing but ‘legalized prostitution. The ‘USA’ network other than the ‘YES’ network (for the baseball & Center Stage) is the only channel/networks I watch, except for when ‘Law & Order’ is on, that show is so ‘depressing’! I wish you would put ‘Castle’ in its place! — PLEASE, PLEASE put Covert Affairs back on! My husband and I look forward each week. We want it back!